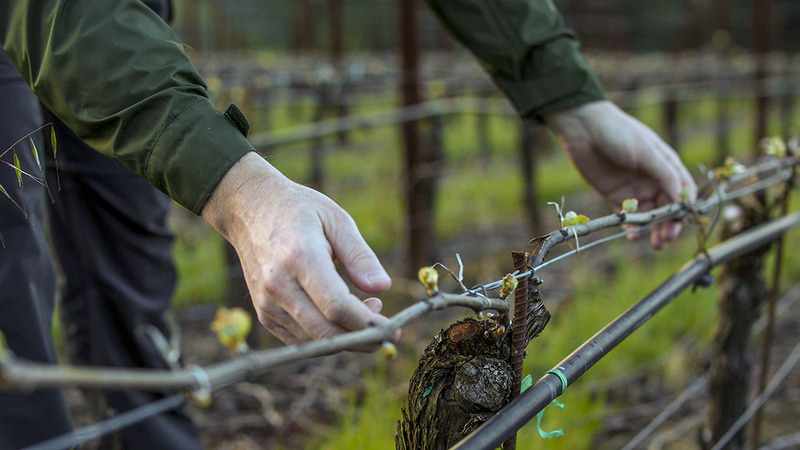 Our Eoin Pinot from the Sonoma Stage Vineyard, a straight shot off San Pablo Bay, is not a wine we produce every year due to its extreme site: cold, windy and exposed. The vines are planted on a rocky volcanic outcropping, a windswept knoll, where they struggle to produce a tiny crop of heritage clone pinot. So you can bet that in the vintages we decide to bottle, the quality is as high as the wine is distinct. It’s our most terroir-driven wine – dark, soil-infused, a little herbal and wild, some brooding tarry elements – less fruit-driven than its stable mates. You have to think a bit about this wine, it doesn’t come easily with loads of simple upfront fruit. And that’s what makes it so appealing. It’s what we call a ‘winemaker’s wine’ – it’s a bit challenging and not for everyone. But what it does deliver is grand-scale complexity – richness of texture and body from tiny crop yields, and broad, sweet mouth-coating tannins. You can drink this soon after release but it will be better given a year or two in the cellar. Deep dark complex aromatics: truffle, tobacco leaf, rich soil, Asian spice, tangy plum and rhubarb. Roasted meat on entry, immediate broad, dense texture. Black licorice, anise and sweet plum. Dark fruit character builds in the glass, cassis and blueberry. Rich broad tannins and soft round finish. Really compelling spicy, layered wine. Savory, salty and mouthwatering wine full of black licorice and anise flavors that build through the wine. Completely unique.